It is hardly a secret that turbo-roundabouts are quickly becoming more and more popular in the UK, the rest of Europe and all across the globe due to their increased efficiency and safety compared to traditional roundabout designs. However, since turbo-roundabouts were only invented fairly recently, they have been introduced rather slowly everywhere outside of the Netherlands, where they were first conceived. Because of this, there is still a lack of universal regulations and guidelines regarding their design. 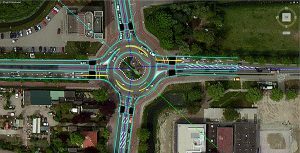 This constitutes a challenge when planning turbo-roundabouts, especially for traffic planners and engineers who operate internationally, for two main reasons. amount of data support. This requires a high degree of flexibility during planning and design stages. For these reasons, the focus of the latest version of TORUS, the first software to feature turbo-roundabout design, lies on international applicability and the easy customisation to regional differences during the design process. In addition, two entirely new features, the Roundabout Wizard and the Adaptive Roundabout, vastly increase TORUS’ functionality. Homola starts by outlining the reasons for the ever-increasing popularity of turbo-roundabouts. Traditional roundabouts, he explains, are a very good alternative to simple junctures because they allow for a steady, slow vehicle flow and lead to overall calmer traffic. At the same time, their capacity can be fairly limited, especially at peak times, and the relatively high number of possible points of conflict mean that they are not the safest option available. 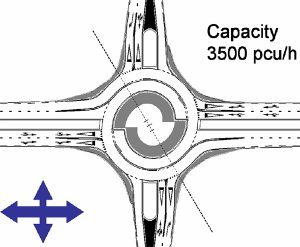 Turbo-roundabouts, by contrast, offer higher efficiency with fewer potential points of conflict. They combine the benefits of normal roundabouts with single or double lanes by forcing drivers to commit to an exit lane even before they enter the roundabout. 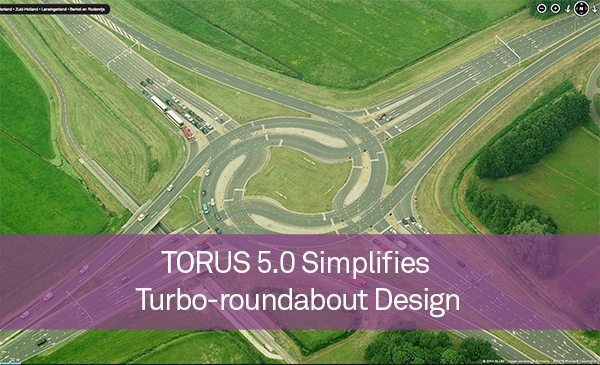 The concrete design process in TORUS 5.0 is modelled after design guidelines from the Netherlands, where turbo-roundabouts were first conceived and developed. So far, there are no national guidelines for the UK, and it may still be a while until such guidelines emerge. This is why it is important to work with design software that can be adjusted flexibly to any conditions required. In some countries one may have to plan for vehicles that have different dimensions than those most common in the Netherlands. Furthermore, one has to assume that the exact specifications according to which turbo-roundabouts need to be built will differ between countries once national guidelines are fully defined. For example, both in the UK and in Germany traffic authorities oppose the usage of physical lane dividers and favour the virtual kind – in sharp contrast to the original Dutch design. TORUS 5.0 offers full flexibility in all the above points. The pre-defined turbo-roundabout designs that are part of the new Roundabout Wizard are based on the original Dutch designs but can be adjusted freely to reflect national design specifications. A drop-down menu includes all national differences known to date, which can be easily included in the first sketch. Furthermore, the new Adaptive Roundabout tool uses the proven AutoTurn algorithm to automatically check swept paths of the (also customisable) vehicles within the turbo-roundabout and display the fastest route through the roundabout – regardless of which software was used for the initial turbo-roundabout design. As part of this so-called Vehicle Envelope Method, the user can place the vehicles within the design in six different sections. In addition, the Adaptive Roundabout provides a reliable analysis of the line of sight, which we will explore in more detail in another article. TORUS requires an AutoTURN installation and is fully compatible with AutoCAD, Civil 3D, BricsCAD and Microstation V8XM and V8i.